After years of anticipation, we finally got our hands on the Nvidia GeForce RTX 2080 Ti, along with its mainstream cousin, the RTX 2080. But, how does the GeForce RTX 2080 Ti compare to its processor, the GTX 1080 Ti? We've now updated this versus piece as we've had time with the brand new graphics card, and have put the two cards through their paces to find out how well they really compare to each other. The GTX 1080 Ti is certainly a tough act to follow, being one of the best gaming graphics cards ever made. It certainly feels like we’ve got the RTX 2080 Ti earlier than expected, but does this mean it’s less of a leap when it comes to performance? Let’s find out. The GTX 1080 Ti launched on March 10, 2017, for $699 (£699, around AU$1,000). Even by Nvidia’s flagship GPU standards, this was a very high price tag, but for many, the pure gaming performance of the GTX 1080 Ti was well worth it. That’s a hefty amount of cash it’s asking for, so the performance better be worth it. Our full review of the RTX 2080 Ti goes into plenty of detail about whether or not it’s worth the steep price increase. In short, it’s a lot more powerful, but not when compared to the price. If that price is too much, then bear in mind that the price of the GTX 1080 Ti may well drop now that its successor is out. It’s well worth keeping an eye out for any bargains on that front. It's certainly a decent spec bump over the 1080 Ti, and in our full review of the RTX 2080 Ti we’ll give the new GPU a thorough test to see just how much faster it really is. As we mentioned earlier, we've now had a chance to run a variety of benchmark tests using the RTX 2080 Ti, so we can better compare it to the performance of the GTX 1080 Ti. As you can see from the results above, the RTX 2080 Ti offers a decent performance boost over the GTX 1080 Ti in a range of graphical benchmarks. While the performance difference isn't that huge in these benchmarks, it does mean that the RTX 2080 Ti is the most powerful consumer graphics card in the world. Impressively, the RTX 2080 Ti also has a lower maximum temperature and maximum power draw than the GTX 1080 Ti, which means it doesn't just offer more performance, but also does it more efficiently. Of course, we also wanted to see how the RTX 2080 Ti compares to the GTX 1080 Ti when it comes to playing games. In the results above you can see that you are getting around 10 frames per second more when playing Total War: Warhammer II. Playing Middle Earth: Shadow of War at 1080p the difference is even more stark, with a 30 fps increase. The RTX 2080 Ti is also a much better performer at 4K resolution. Shadow of War hits 74 fps, much higher than the holy grail of 60 fps at 4K. Meanwhile, the GTX 1080 Ti falls just short, hitting 52 fps. As with other series 10 graphics cards, like the GTX 1080, the GTX 1080 Ti is built on Nvidia’s Pascal architecture, which Nvidia promised would deliver three times the performance of previous-generation graphics cards, while excelling at virtual reality and other advanced gaming technology. With Pascal, Nvidia introduced its 16nm FinFET process, which brought improved efficiencies, higher densities of transistors, and increased performance. The RTX 2080 Ti, however, is based on Nvidia’s new Turing GPU architecture. This features the debut of RT Cores, which are specialized cores used to compute how light and sound travel in a 3D environment at a rate of up to 10 GigaRays. 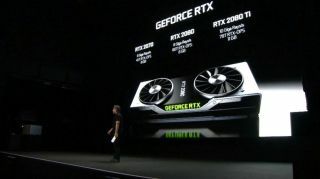 They should allow Turing GPUs like the RTX 2080 Ti to process real-time ray tracing 25-times faster than Pascal architecture. Turing architecture also carries over Tensor Cores from its Volta architecture, which can deliver up to 500 trillion tensor operations a second that benefits AI-driven rendering methods, such as deep learning anti-aliasing. As with Volta, Nvidia Turing has adopted GDDR6 memory that clocks in as fast as 14Gbps, and features 18.6 billion transistors compared to Pascal’s 11.8 billion transistors. Nvidia GeForce RTX 2080 Ti vs Nvidia GeForce GTX 1080 Ti conclusion: should you upgrade? Now that we've had time with the RTX 2080 Ti to properly compare it to the GTX 1080 Ti, we can conclude that there's no doubt that the RTX 2080 Ti is the world's most powerful gaming graphics card, and easily surpasses the GTX 1080 Ti. If you want the very best of the best, then the RTX 2080 Ti is the one to go for. However, the GTX 1080 Ti is still an absolutely brilliant graphics card, so if you want to save a bit of money and don't need to hit 4K resolution at full graphical settings, then the GTX 1080 Ti is well worth considering. But what about if you already own a GTX 1080 Ti? Should you make the upgrade? We'd say probably not. The performance difference isn't that immense to warrant an upgrade. For most people, the GTX 1080 Ti will be more than good enough for the next year or more. Otherwise, you may be able to sell your GTX 1080 Ti for a still decent price, then put that money towards an RTX 2080 Ti if you really must have the very best GPU.